If you enjoy the travel blog and want to know about future trips the best way is to 'friend' me on Facebook at https://www.facebook.com/norm.collins.33. As well I usually post a few photos on Facebook. Ditto. Same thing today - a nice liesurely breakfast; a few hours of relaxation and down time and then a drive through the nearby countryside where we encountered flocks of goats and sheeps, along with theri shepherds. Again we ate dinner at Cortijo El Guarda, with great food and great service from Hans and Miranda. Details and photos at the Spain 2019 tab. After a quiet late morning / early afternoon at El Guarda we took a short drive for a drink and a small tapa in the scenic nearby village of Sentenil. For dinner we took Miranda's recommendation to eat at El Murrel de Arriate - a restaurant in the old train station in Arriate where we enjoyed a wonderful meal. Other than a quick into town to have a flat tire repaired we spent the entire day at Cortijo El Guarda, including dinner. Such a beautiful property. We decided to head out on a half day trip today to Fuent de Piedra to visit a donkey refuge and flamingo sanctuary. Very worthwhile not only for the two destinations but as well the scenic drive. We returned to Polear, a restaurant in Alcala del Valle at which we had eaten on two previous occasions. Again we enjoyed a fantastic meal. We left Cortijo La Haza and Iznajar today and headed west to Alcala del Valle. Along the way we stoppped for short time in Antequera before arriving at Cortijo El Guarda, our home for the next five nights mid afternoon. After a nice chat with Miranda and Hans we went into Alcala for the asparagus festival, after which we had dinner in a local restaurant. We spent the entire day at Cortijo La Haza. Having been somewhat busy in Sevilla it was nice to relax in the numerous seating areas on the property. There seemed to be no need to tour the area, dominated by miles and miles of olive trees. Again we enjoyed a superb dinner courtesy of Patrick. Our last morning in Seville today. Shortly after noon we were taken to the airport where we picked up our rental vehicle and off we were for Iznajar where we will stay the next two nights. We easily found our cortio where we enjoyed a fantastic dinner. Today we returned to and visited the Real Alcazar - beautiful ornate buildibngs and wonderful expansive gardens in the centre of the city. Early evening we took in a flamenco show after which we enjoyed another tapas style dinner. A quiet day here in Sevilla. After an excellent filling breakfast we went for a stroll, first by the Cathedral, past the Alcazar, and then to the river which we walked along to complete the circle back to our hotel. Just before returning we stopped for a late afternoon tapas. Dinner was again of the tapas style at a nearby restaurant. We made it. The flights to Toronto and Amsterdams were both on time although the final leg from Amsterdam to Sevilla was 1 hr 15 min delayed meaning arrival at our hotel not until near 10:00 pm. Fortunately restaurants are open late - we arrived at 10:50 pm and got the last table available. We enjoyed a number of tapas size dishes. Our next trip takes us back to Spain, specifically a return to Andalucia. The first three days will be in Seville after which we will be at two cortijos in the Andalucian countryside. Due to my upcoming (June) golf trip to Ireland we weren't planning a spring getaway but with the cortijo, which we have stayed at three times, being sold and the opportunity to spend my 65th birthday in Spain we couldn't resist. We leave Sunday evening, April 7th with our flights taking us from Halifax to Toronto to Amsterdam and finally to Seville. Our trip came to an end today. With an early afternoon flight we were not rushed, having plenty of time for the one hour drive to the airport. Smooth flight to Montreal where we experienced a 1.5 hour delay due to a late arriving plane. Temperatures ranged from low 30s in Liberia to minus 13 in Montreal. Memories of the trip, along with financial details, links to lodgings, and photos all at the Costa Rica 2019 tab. Another quiet day spent entirely at Casa Mapache until we went into Tamarindo prior to sunset for dinner on the beach at Pangas. Not much to report today. We again started the day with a hearty breakfast, spent time in the pool, went into Tamarindo to have a late afternoon meal (at the Green Papaya) and then another vibrant sunset. Last moving day. We spent the morning and early afternoon at Mundo Milo, working on the travel blog and enjoying the pool. We left mid afternoon for the short (< 1 hour) drive past Tamarindo to our final stop - Casa Mapache, another small B&B run by another French couple. Today nature gave us monkeys, crocodiles and another gorgeous sunset. Most of the day was spent at Mundo Milo with an early morning walk to the beach, during which we saw a troop of monkeys and their infants. In the afternoon we drove the short distance to Playa Blanca where we found the fisherman with the crocodile and then early evening it was back to the beach for the sunset. Life is sweet. Our first day at Mundo Milo was very relaxing - a leisurely breakfast that included a large serving of Gallo Pinto; time working on the travel blog; and dips in the pool. We then returned to the beach where indeed there were 83 hatchlings waiting to be released to the sea, a wonderful experience to observe. We left La Colina Pura Vista this morning for a lengthy drive first further down the coast, then cross the Nicoya peninsula towards the east side and north to Junqullal and Mundo Milo Eco Lodge. Ditto to yesterday. Another relaxing day enjoying the pool and the peace and quiet of La Colina Pura Vista. Late in the afternoon we returned to the beach and Locos Cocos for a drink and another great sunset. A quiet day, mostly spent around the pool. Late afternoon we went down to the beach where we enjoyed a nice meal in a great setting at Locos Cocos. Spectacular sunset. Travel day. We left Hotel Luna Azul, driving the gravel road south with a short stop in Samara. We then continued another hour plus to Playa San Miguel, a beautiful 8 km beach and La Colina Pura Vista, our home for the next three nights. Not much different than yesterday. Most of the day was spent lounging around the pool although we did take a short (4 km) drive to nearby Ostional beach where we did see a flock of pelicans. An absolutely do nothing day as we never left the property. Breakfast, a dip in the pool, work on the travel blog, back to the pool, a nap on the lounge chair, another dip and dinner. We started the day with the farm tour, seeing cows, chickens, guinea pigs, sheep, a horse and rabbits. We all had a chance to milk the cow. Eventually we were on the road heading to the Nicoya peninsula and the coast. The last hour plus of the drive to Ostional and Hotel Luna Azul was difficult over a rough gravel road, but well worth the effort. Today was a special day as we delivered beanies and other supplies to children at the Bijagua school. Afterwards we drove a dirt road on the Volcan Miravalles side - much longer than planned but a nice drive through the rolling countryside. We stopped at Pizzeria Barrigon for drink and better internet and then spent the afternoon relaxing. before going to dinner at a nearby lodge. As we expect will be the case at most places on this trip the day after arriving did not have us leaving the property. After a traditional Costa Rican breakfast during which we were treated to a show of birds and squirrels eating bananas put out for them. In the afternoon we walked the nature trail, seeing a number of monkeys along the way. Dinner was left over pizza. Moving day, and unfortunately vehicle replacement day as our vehicle 'died' shortly after leaving Heliconias Nature Lodge. Once the vehicle was dealt with we drove north past the Tenorio volcano to Bijagua and Casitas Tenorio, our 'home' for the next three days. Today was off to Tabacon Thermal Springs & Spa where we enjoyed the afternoon relaxing in the many pool and rivers of warm water originating from the Arenal Volcano. Our admission included a nice buffet dinner. Today is Gayle's birthday. We tried to get into Tabacon Thermal Springs but there were no tickets available so we spent some time at the Costa Rican Dog Rescue Centre were we walked four of the dogs for over an hour. Gayle loved it. We then enjoyed a traditional meal at a small local restaurant. We spent the entire day at the Nature Lodge. A typical Costa Rican breakfast followed by time by the pool, a nap and dinner. Very relaxing - kind of what vacations should be. Up at 3:45 am; depart at 4:20 am to get back to the airport for a 7:20 am flight to Liberia, Costa Rica. A 4 1/2 hour flight had us arriving just before noon. We rented a vehicle and set off on what was supposed to be a 3 hr drive (but took longer) to La Fortuna near the Arenal volcano. We arrived at the Heliconias Nature Lodge where we will be the next four nights. As a result of an early morning flight through Montreal being cancelled we over-nighted in Toronto, taking the opportunity to visit our friends Steve, Wendy and Mike. A short but nice visit, again with 5 * hospitality (and equally 5* pizza for dinner). We left Le Mole Sul Farfa after breakfast driving through the Sabine hills with a short stop in Bocchignano. We then continued west across the River Tiber and on past Lago di Bracciano to Ceri, our last stop, located on a fortified plateau. We enjoyed dinner in the small village before packing for our morning departure. A few photos and details at the Italy 2018 tab. A do nothing day. First it rained most of the day and second Gayle was not feeling well so we simply stayed put, me working on the travel blog and Gayle resting. Dinner again at our agritourismo. After a great stay we left Borgo di Carpiano driving through the scenic landscape of the Umbrian hills to Assisi where we stopped to stroll through the well known town. We continued past Spello, which looked nice as well but time precluded a stop, and Foligno, Spoleto, east of Terni and through Rieti and on to Mompeo in the Sabine Hills where we will be for the next two nights. After a great stay we left Borgo di Carpiano driving through the scenic landscape of the Umbrian hills to Assisi where we stopped to stroll through the well known town. We continued past Spello, which looked nice as well but time precluded a stop, and Foligno, Spoleto, east of Terni and through Rieti and on to Mompeo in the Sabine Hills where we will be for the next two nights. More at the Italy 2018 tab. The morning was spent at the Borgo with the afternoon in Gubbio, a nearby medieval town. After wandering through a very interesting town we returned to enjoy another wonderful meal. A very enjoyable day. Today was a quiet stay put day - we did not leave Borgo di Carpiano, spending the day simply relaxing. A great breakfast and another nice dinner. More cakes and sweets for breakfast and we were off and on our way. We stopped to walk around Monte Castello di Vibio - it was raining yesterday - and then drove north past Perugia and on towards Gubbio to our next stop - Borgo di Carpiano, another wonderful boutique hotel with wonderful ambiance and food. Our second consecutive yucky day. More delicious cakes for breakfast after which we took a short drive to yet another hilltop medieval town, Monte Castello di Vibio. After a short stay we returned to our agritourismo, relaxed for the afternoon and then enjoyed another filling dinner. Unfortunately the weather turned. Overcast with likelihood of rain and cool. After breakfast we went to nearby Doglio to attempt to get Wifi access but without success. We continued on to Todi, a worthwhile visit on its own, spend some time in a cafe, bought some meat and cheese and returned to Podere le Corone. We awoke to another great day. Early morning coffee, a Turkish sauna, a nice breakfast brought our stay at Lupaia to an end. We left noonish for a scenic drive through southern Tuscany, and on to Umbria, ultimately to Doglio near Todi and our next stop at Podere le Corone. A short drive (only 20 km) moving from Fonte Bertusi to Lupaia. Today was a photographers delight. After a wander through Pienza we went to Lupaia, an upper-end lodging outside Montepulciano. Our hopes for a nice day were granted. We arrived early, enjoyed the property and a wonderful dinner. We enjoyed an extensive, wonderful buffet breakfast - great coffee including cappuccino scuros (doubles), pastries, cereals, yoghourt, eggs, juice, including blood orange juice, fruit, meat, cheese, little sandwiches and on and on. The weather was not great - overcast, cool and later on showers. We spent the morning doing wash and then in the afternoon went to nearby San Quirico d'Orcia and Monticchiello. We bought some food and ate in our apartment. After a light breakfast we decided to wander around Orvieto for a couple of hours. We then headed to the countryside as we drove north to Pienza. We stopped in the hilltop medieval town of Radicofani where we were able to get a table (just) at the one restaurant where we had a wonderful (and overly filling) mid day meal. We continued on our way through some beautiful rolling hills and cypress trees, easily finding our lodging just outside of Pienza. Transition day as the Greece portion of our trip came to an end (see the Greek 2018 tab for Memories, lodgings and costs) and the Italian segment began. We had a very early (6:30 am) flight from Karpathos to Athens connecting to an Athens to Rome flight. All were per schedule. After picking up our vehicle we drove a couple of hours north to Orvieto where we stayed the night. The morning was miserable - a considerable amount of rain; very unusual for this time of the year but being our last day we gambled and headed to the west coast of Karpathos. What a difference - sunny blue skies, perfect for some time in the gorgeous turquoise water. But when we crossed the mountains back to the east coast the weather deteriorated. We stopped in Pigadi to pick up some food in order to eat in as we packed for our early morning flight. A mostly quiet day. After an unbelievable breakfast we did a 'dry run' to the airport in order to know how long it will take given our early morning flight. We continued around the south coast to the west side and the small towns / villages of Arkasa and Finiki, where we had dinner. Back across the inland, through Menetes to Althea Villas. Moving day. We left Kyra Panagia on a windy morning for a short drive further south, past Pigadia to Ammoopi where we will be staying at Althea Villas for the next three nights. Windy windy windy! For dinner we went to the traditional village of Menetes where we met Eri, who fed us and then showed us her interesting traditional Karpathian home. A similar morning - do-it-yourself breakfast and a visit to the beach. In the afternoon we drove what was a spectacular route to the north end of the island and the traditional village of Olympos, where a number of women greet the tourists in their traditional dress. Nice dinner, including a vegetarian moussaka for Gayle. A real do nothing day as we stayed put in Kyra Panagia - first making our own breakfast, then down to the beach for a swim, then back for quiet time, aka a nap, then back to the beach, then dinner. All very relaxing and and enjoyable. Up real early for a 5:20 am ferry to Karpathos where we were met with our rental car. We had a coffee and yoghurt in the port town of Pigadia before driving up the coast towards Kyra Panagia, a small village on a beautiful beach, where we will be staying the next three nights. Ditto yesterday. Really no where to go and not much to do other than enjoy the scenery, swim and relax. Another very quiet / relaxing day. Our first of two days in the port of Chalki. No car rental - just enjoying our apartment and the spectacular views and wandering through the port. A couple of swims, some work on the blog and dinner. A very quiet / relaxing day. Nothing exciting today. With a late afternoon ferry Maria allowed us to stay in our room until we had to depart. We lingered over breakfast, enjoyed another swim - the water is so warm - and just hung around until Maria delivered us to the port for our 1 1/4 hour ferry from Tilos to Chalki. We easily found Villa Praxithea and checked in. Down to the harbour where we picked a restaurant for dinner. Pretty much a repeat of yesterday with a walk into Lavadhia after breakfast, a drive through the rugged mountains to pretty much nowhere in the south-west, another enjoyable swim and dinner, all under blue skies while enjoying nice temperatures. Today was a 'Tilos' day. A late breakfast during which we had a nice chat with Maria. After time relaxing we took an afternoon drive to the far end of the island, with a swim along the way. Dinner at a restaurant right on the water. Slow and relaxing, consistent with the vibe of the island. After spending the morning at Zacosta we wandered around the old walled town of Rhodes before being delivered to the ferry by John. The ferry to Tilos, a bit over two hours was smooth. We were met by Maria who delivered us to her Marina Rooms on the other side of the bay. We could immediately see this was going to be quiet, relaxing stay given the size of the main town. After settling in we had a nice dinner at a nearby taverna, with a great table looking directly out to the sea. We had a late afternoon ferry from Symi to Rhodes today. After checking out of Thea Apartments we walked the other side around a corner, and then another to Nos beach where we had another enjoyable swim. We stopped on the way back for an afternoon meal and then returned to get our backpacks from Panos who stored them for the afternoon. The ferry took us to Rhodes where we were met by John and our golf cart ride through the old town to Zacosta. After a nice breakfast we went up to the old town of Chorio, and nice stroll of winding alleyways past well maintained homes and shops. The village had a very lived in feeling. We stopped at a cafe for drinks and cakes before returning to Pedi and taking a water taxi out to Marina Beach. Dinner was back on the harbour side at a nice taverna well up the hill and therefore with great views of Gialos. We awoke to simply admire the view of what is no doubt the prettiest harbour we have been in. The pastel colour buildings are so attractive, and photograph well. We picked up our rental vehicle and moved to another lodging in the nearby bay of Pedi (Thea apartments was fully booked) and then drove to the far end of the island and Marathounda Beach where we enjoyed a swim and some food in the taverna. With our ferry not leaving until 1:00 pm we enjoyed a leisurely breakfast at Zacosta, including nice chats with John and George, who took us to the port and the ferry. The trip to Symi is only 50 minutes. After checking in we spent the afternoon relaxing and enjoying the view of the harbour. Then a short walk-about and dinner. Nothing much to say on this travel day. Up at 6:00 am; left Brugge at 6:50 am for the two plus hour drive to the Brussels airport where we boarded our Aegean flight to Athens. After a three plus hour stop-over we flew on to Rhodes. After checking in to our hotel we went out for our first Greek meal. We spent a relaxing morning at Canal Deluxe B&B before heading out to walk the streets and alleys of Brugge, including with a walking tour Lots of interesting architecture and shop after shop of chocolates and/or waffles. Rather than backtracking to Toronto or Montreal we took an Icelandair flight with a transfer in Rejkyavik to Brussels. Being unable to make the connection to Athens we added a day, rented a car and drove to the city of Brugge for two nights. Our next adventure, will take us back to the Dodecanese Islands of Greece, where we spent six nights on the island of Rodos in 2010. However before arriving in Greece we will be spending two nights in the Belgium city of Bruges. Our Icelandic flight (overnight September 8, 2018) could not make the connection to Athens and rather than just one night near the airport we decided to drive the 1 1/2 hours to a city we have heard wonderful things about - Bruges, where we will stay September 9th and 10th. It is then on to a number of Dodecanese islands, first flying in to Rodos where we will stay the night due to ferry scheduling. We will be returning to a hotel we stayed at in 2010 - Zacosta Villa Hotel, within the old walls, arriving on the late flight from Athens. Early the next afternoon we are off to Symi (north of Rodos) for four nights. We then need to return to Rodos for a night as there is no direct ferry to Tilos that coincided with our itinerary. Then it is off to Tilos (north-west of Rodos) for three nights, after which we are on to the island of Chalki (Krevatia on the map) for three more nights and then south-west to Karpathos for the last six nights of our time in Greece. From Karpathos we then fly, through Athens, to Rome for the second part of our trip - in central Italy. Another trip in the books, all in all surpassing our expectations. Given it was still May in the mountains the weather was actually better than expected - not hot but reasonably warm with minimal rain. Perhaps we didn't meet that many other travelers but our hosts were very hospitable. Menorca was wonderful and we were especially pleased with the places we chose to stay. Check back mid September for our next travel blog as we will be off to Greece and Italy. Until then enjoy the summer. Up at 6:00 am; on the road at 7:00 am, before any one else was awake, and at the airport 15 minutes later as planned. Our Vueling flight to Barcelona was on schedule as were our Air Canada flights, first to Montreal and then to Halifax. Fortunately on the long flight to Montreal we had an open seat beside us providing some extra room. As always it was a long day, arriving back in Halifax at 10:00 pm, or 3:00 am Menorcan time but its a small price to pay for the opportunity to travel in Spain. After breakfast we packed and left Binagus Vell and our last stop ... Binissafullet Vell. After settling in we again drove to the north coast and another afternoon at the beach Cala Pregonda. After returning to Binissafullet Vell we had our last meal of the trip, a nice Italian dinner. After enjoying another great breakfast and the morning at Binigaus Vell we drove to the north coast and Platja de Cavalleria. An easy 7 to 10 minute walk brought us to a wide curving sandy beach where we enjoyed the sun and warm temperatures. We then went to the Cap de Cavalleria and stopped in Fornells on the way back before returning for dinner. We left Ses Talaies this morning after an enjoyable three days on the west side of the island driving to the centre of the island and Binigaus Vell, checking in shortly after noon. After wandering around the property we checked out two beaches on the south coast before returning for dinner. While it rained this morning it cleared up early afternoon allowing us to go to a beach on the north coast and then a town on the south coast, where we ate dinner - Menorca being a relatively small island. After a traditional (complete and filling) Spanish breakfast we took a short drive to Cala Morell, a small north coast resort village. Not much of a beach with overcast weather so we returned and spent the afternoon in Ciutadella where we had an early dinner. A 4:00 am bus departure is not a great way to start one's day but we returned to the airport and had no problems with our flight to Menorca. We first stopped off at Binissafullet Vell (where we were supposed to stay) and then drove to the west end of the island for the next three nights. More details and photos at the Spain 2018 tab. The plan was to spend the morning/early afternoon in Barcelona and then to the airport for a short flight to Menorca. However our flight was cancelled (re-booked next morning) necessitating a 1 hr 45 min bus trip well north of the city. We spent the day in Barcelona - at a much slower pace than last year when we visited Park Guell and Segrada Familia. This year we just wandered through the streets and alleys of downtown Barcelona, admiring the interesting buildings and stopping now and then just to watch the people. We left Hotel Can Cuch this morning to the coast and then into Barcelona. We turned a bit late forcing some driving through the city but managed to find the car rental return office. A taxi from there to We Boutique, the same place we stayed last year and then a short walk before returning to Casa Lolea, where we ate last year, for another enjoyable tapas dinner. The weather during the first half of the day was not great, and given the 5 km drive steeply up a narrow lane to get to the hotel we decided to stay put. Fortunately it cleared in the afternoon in order that we could enjoy our bottle of cava in our nice sitting area outside our room. A lengthy drive today back into Spain through a mountain pass east of Puigcerda and then a National Forest south/east of Vic - twists and turns, up and down; with lots of wildflowers. We eventually made our way to Hotel Can Cuch, a beautiful hotel isolated up in the National Forest. As great as our breakfasts have been Chateau Brangoly's may take the cake - well actually three cakes - carrot, apple and chocolate. Quite the spread. In the afternoon we popped over to Spain to fill up with gas and then drove through a valley and along the slopes of a mountainside, stopping at a small market. We returned for another excellent dinner. We left Eve, Antony and the three dogs to continue our travels further south, nearly to the Spanish border. Perhaps one of the most scenic days of driving including the drive west to Ax-les-Therms, then south with a diversion into Andorra and finally to Brangoly and the Chateau Brangoly where we were fed like kings and queens. After yet another nice breakfast and a morning working on the blog we went out for what turned out to be an enjoyable afternoon drive through some scenic countryside, with the usual abundance of wildflowers. After nearly 100 kms we returned for yet another delicious dinner. We continued east through the Pyrenees - generally a flat drive, not through the mountains past the towns of St. Giron and then Foix. A nice if not spectacular drive. We worked out way to an isolated valley and then ascended the mountainside to Domaine des Massols. This afternoon we went for an enjoyable drive in the area, over a mountain pass and through some lovely valleys, the one from Seix to Aros to Moulis being particularly scenic. A bit of rain at Lac Bethmale put a damper on the drive but otherwise it was a nice trip. We returned for yet another wonderful meal at L'Ancienne Bergerie. We left El Acebo and Spain today, driving over (and under) the mountains to France where we drove over a couple of mountain passes (along which this year's Tour de France is routed) and down a valley to Orgibet / Galey where we found L'Ancienne Bergerie, our 'home' for the next couple of nights. Photos etc. at the Spain 2018 tab. Our second full day in the area after breakfast and a some work on this travel blog we went for a short drive through a number of small villages hugging the mountain side. Lots of animals and great vistas. We returned to Casa Javier for dinner. Today we drove up the valley to Benasque and then on to the Park Natural Posets-Maladeta where we stopped for a coffee/beer at the Hotel Hospital de Benasque. A stop on the way back in the village of Ancils before returning to Casa Muria. We enjoyed dinner at Casa Javier, where we ate in 2011. After an extremely interesting chat with David during which he provided a complete history of the Casa and failed dam project in the valley. After finally leaving after noon we stopped in the abandoned village of Janovas and then the nearby town of Ainsa. We then continued driving north towards Castajon de Sos near which we found our next stop in the nearby hamlet of Renanue. We spent the entire day at Casa de San Martin mostly lounging about. We of course enjoyed a wonderful breakfast, nice chats with David, a walk along the 'road', relaxing on one of the many nice benches, playing with the dogs and then being fed wonderfully. A great relaxing day. We left Heredad Beragu driving first past Sos del Ray Cotolico, a bit north and then east past Jaca and on to San Martin where we stayed in 2011. We were greeted by David, who looked after us on our previous visit. Being the only guests this evening we enjoyed a very quiet evening, including our own private dining room. Two highlights today; first 1,100 +/- sheep passing beneath our hotel balcony, and a chat with the shepherd later in the day, and second a climb to and visit of the church and crypt of the 11th Century Inglesias San Salvador. Photos and a video (of the sheep) at the Spain 2018 tab. We left Getaria driving through some very scenic areas, first with the coast in sight and then through the lush Basque hillsides. Not too much along the route other than an abundance of roadside wildflowers and lots of animals. Ultimately we arrived in Gallipienzo, a medieval town dating from the 9th Century. The plan today was to either drive down the coast to a couple of fishing villages or up into the hills through the vineyards, or both, but the weather did not cooperate. Although there were the occasional sunny periods it was mostly overcast and raining, and still quite cold. Other than a midday walk through town we spent most of the day indoors. Photos and more at the Spain 2018 tab. A much colder day (high of only 12 C) with a few showers during our drive. We first stopped at the Muga Bodegas, crossed the Camino de Santiago twice and worked our way to the coast and the Atlantic Ocean, eventually reaching the seaside Basque town of Getaria. After a surprisingly excellent breakfast we left Enclave Soria driving north through the Sierra de la Demanda and into the Rioja regions, ultimately to Zarraton, where we stayed in a Palacio originally built in the XIth century. Our flights were all on schedule with an early morning arrival in Madrid. We drove a few hours north-east near the town of Soria where we spent our first night. On the way we stopped in a couple of interesting villages and met a shepherd. It certainly is nice to be back in Spain! With this trip behind us our next adventure will take us back to Spain for four weeks from May 09, 2018 through June 07, 2018. We will be returning to the Basque area of northern Spain (we were there in 2011) and then across the Pyrenees, first on the Spanish side with a week on the French side. Back through Catalonia to Barcelona with a week in Menorca to finish the trip. Check back for the travel blog. Having enjoyed the Pacific side of Costa Rica so much last year we decided to return only a year later. This time though we will be going to the Caribbean side and then south into Panama and the islands of Bocas del Toro, with the final two days in Panama City. Up early for a 5:30 am shuttle to the airport where we took a COPA flight from Panama City to Cancun where we changed to an Air Canada flight directly to Halifax, arriving just before 7:00 pm and bringing an end to another interesting and great trip. Our last day in Panama City. Rich arranged a half day tour with a dedicated driver - to a memorial to the Chinese, a visit to the the community of Amador and a couple of hours at the Panama Canal Milflores locks before driving through the dense downtown of Panama City and out to our hotel near the airport. For a few photos go to the Costa Rica Panama 2018 tab. A full day in the historic district of Panama City - Casco Viejo. We wandered the streets, ran into Monica and Lucia, did some souvenir shopping, and ultimately struggled to find a place for dinner. All in all a good day. After breakfast we went with Dave for a tour of the nearby Ngobe Salt Creek village. Dave is very passionate about the Ngobe, providing us an interesting tour. After returning to Casa Cayuco and having lunch Dave took us back to Bocas town where we caught a short flight to Panama City. After settling in to Casa Sucre in the old Casco Viejo part of Panama City we went to dinner at a Peruvian restaurant. For the most part a similar day - periodic downpours with the sun appearing on occasion between. In the afternoon seven of us took a hike through the jungle, wading through mud and ponds until we ultimately reached the shore along which we continued our walk until returning to the lodge. Today was a quiet day, in part due to the frequent downpours. We ate three good meals, took a nap (or two), listened to the pounding surf and the periodic downpours. After breakfast we took what turned out to be a 2 1/2 hour tour of the farm encountering a mama sloth with her young one, cocao trees and lots of muddy jungle. After lunch we we picked up by Dave and boated around the other side of the island to Casa Cayuco, the next eco-lodge of our Bocas island trip. Unlike the other guests we did not take a tour. Rather we lingered over our three filling meals and make maximum use of our rancho, getting lots of exercise ascending and descending between the lodge and our rancho. We left Finca Vela early afternoon, being taken back to Almirante where we got a water taxi to Bocas Town from where we were picked up for a 20 minute boat ride to La Loma Jungle Lodge where after introductions we climbed the 153 steps to our Rancho cabin. As promised the climb was worth the view. Pretty much a repeat of yesterday with a 1 1/2 hour tour of the Finca after breakfast by Herve. The afternoon was again spent relaxing and swimming / paddle boarding (at least Gayle). Rest and relaxation enjoying our pretty little cabin right on the water, watching the birds, swimming a bit, working on the travel blog and just sitting around, sort of what vacation is supposed to be. We left Banana Azul this morning, taking a bus from Puerto Viejo to the Costa Rica / Panama border, crossed and then took a 1 hour shuttle to Amaranti where we were picked up for our 15 minute boat ride to Finca Vela Lodge. Today was a big day, being Gayle's birthday. We started with some time on the beach watching a couple of surfers, went to a wildlife rescue centre to see the botanical gardens and a number of animals, including a few sloths, and finally enjoyed a wonderful meal at a very nice Italian restaurant in nearby Playa Cocles. The entire day was spent at Banana Azul. After breakfast we sat on the beach watching a couple of surfers. We would have gone into town in the afternoon but just before we were about to leave it began to rain, a rain that continued for a few hours resulting in us staying put. After another enjoyable breakfast and a nice chat with Jose, Didier and a demonstration of towel art by Xenia we left Hotel Quelitales for a lengthy 4 1/2 hour drive to Puerto Viejo, on the Caribbean sea south near the border with Panama. The drive was quite hilly for the first few hours before flattening out approaching Limon and then south to Puerto Viejo and our next stop - Hotel Banana Azul. A leisurely day - starting with a really nice breakfast with a huge serving of very flavourful gallo pinto. Some bird watching, relaxing in our cabin and then a late afternoon 1 1/2 hour drive to Cachi, around the lake to Paraiso and back and it was time for another great dinner. An early morning flight (5:50 am) to Montreal, connecting to a direct flight to San Jose. After picking up our rental vehicle we drove through San Jose, east to Cartago, Paraiso and finally Cachi and our hotel for the first two nights, the Hotel Quelitales at the top of a valley in the rain forest. Off to the Mediterranean again, this time to Greece. First it is the island of Naxos and then a return to the islands of Koufonissi and Amorgos. We return to the mainland where we will rent a car to tour the Peloponnese with a few days on the island of Kythira off the south coast. Finally will will be spending the final three nights in Istanbul. Today we returned home ... business class. We got a great Aeroplan deal that was too good to pass up. With a mid-afternoon flight we left our hotel shortly after 10:00 am in order to spend time in Istanbul Turkish Airlines lounge. Pretty special. Check out the Greece Istanbul 2017 tab for more details. Our second and final full day in Istanbul. The weather was much nicer today - still cool but mostly blue skies with only a few clouds. We went to the Blue Mosque (impressive inside and out), the Grand Bazaar and another bazaar on our way home. A fair amount of walking. Our first day in Istanbul the weather was not great but for the most part the rain held off. We wandered through the sights of the Sultanahmet historical area of Istanbul including the Blue Mosque, Haggis Sophia and Hippodrome. After stopping for a light lunch we went into the Ayasofya museum. We left Nafplion this morning, driving the three hours or so to Athens and the airport for our flight to Istanbul. Being our last day in Greece we have included a 'Memories of Greece' along with information on costs and the places we stayed. We spent the day in the old town of Nafplion, first visiting a small folk museum and then wandering the narrow alleys and strolling along part of the harbour. Being somewhat of a 'city' with many shops we did a little shopping before joining Linda and Bill for dinner. Another moving (primarily driving) day although we did get a swim in. After turning inland through the mountains we encountered rain, at times heavy. Some dramatic mountain driving eventually led us to Nafplion where we arrived very late afternoon. A pretty light day. Breakfast of course and then a drive north to Drialos to look at some pottery, then south to Mezapo Beach, then to Gerolimenas for a drink in a water side cafe/taverna then further south to Marmarioui Beach and finally back for dinner. After a unique, tasty and filling breakfast and some frustration working on the travel blog (WiFi is not the best here) we went out on a drive around the Mani peninsula. We first drove south through Gerolimenas near to the southern most point in Europe - we turned around a few kms short, and then through the mountains and north up the west coast. Very dramatic. After completing the loop we enjoyed another excellent dinner. We left Monemvasia after breakfast driving north up the coast where we stopped for our daily swim. Then across the mountains down to Skala, on to Gythion and then down the second 'finger' of the Peloponnese to Citta dei Nicliani in Kitta where we enjoyed a wonderful meal. Today was spent entirely within the walls of Monemvasia, a small island off the coast, founded in 583. We enjoyed a great breakfast, relaxed, and wandered around the village, and ended the day with a fabulous meal. With a 2:00 pm ferry we had time to go down to the harbour of Avlemonas and enjoy a swim - calm as can be it was nice. We returned to shower, pack and then back down for lunch. We then drove the 15 minutes to Diakotis where we caught the ferry back to Neapoli. We then drove 45 minutes to Monemvasia. After a spectacular sunrise and a cup of coffee we went out to see Kythira. First to Potamos to buy our return ferry tickets, then to Agia Pelagia for a swim, then all the way south through the areas burnt by the massive fire of 2017 to Chora, a couple more beaches and dinner in a traditional taverna in Kalamos. Up early and a quick breakfast before leaving at 7:30 am for the hour drive to Neapoli where we picked up our ferry tickets and boarded the ferry to Kythira with a few minutes to spare. We found our lodging fairly easily, went into Avlemonas for a drink and a bit of food as they got our room ready. We then settled in and relaxed for the early afternoon before going to Kaladi beach for a swim. Then a drive around this quarter of the island and into the village for dinner. Today we left the mountains of the Peloponnese heading south to Elia. Our departure was somewhat delayed as we unexpectedly spent about 1 1/2 in cafes in Stemnitsa. After the 2 1/2 hour drive through orange groves and olive trees we reached the seaside town of Elia where we enjoyed a wonderful meal right next to the harbour. Late getting up, a late breakfast and a late departure to drive to Dimitsana and through the gorges of this area of the Peloponnese. But a beautiful drive it was through the mountains. We returned to Stemnitsa around dinner time when we had a light meal again in the square. A travel day. Up at 4:45 am to catch the 6:00 am ferry from Amorgos to Naxos (arriving at 9:10 am). Breakfast in Naxos town and then a taxi to the airport for the 25 minute flight to Athens were we picked up our rental car to drive three plus hours across the Peloponnese and up into the mountains to the small village of Stemnitsa. After breakfast at a restaurant in the village we wandered through most of the back alleys and squares of Chora. We then took a drive to the far end of the island, past the shipwreck to another beach for our daily swim. On the way back we stopped at a dramatic cliff-side bar for a drink. We then returned to Chora and went for an early dinner given the hour we will need to get up for our early morning ferry. We left Pano Gitonia and Aigaili today, driving the short half hour to Chora, the medieval capital of Amorgos, in the centre of the island, up the mountain from the port of Katapola. We easily found our 'traditional house' and spent the afternoon wandering through the alleyways of this village with character. A trip down to the port to pick up our ferry tickets and out the other side of Katapola where we walked 20 minutes to a beach for our daily swim. Then back to Chora for dinner. These three days are effectively carbon copies of each other. Each day was sunny, hot and essentially cloudless. The mornings were spent at Pano Gitonia staring out to the harbour, town, beaches, and mountain village. We made a light breakfast - coffee, juice, sweets and yoghurt and caught up on emails or worked on the travel blog. Then in the afternoon it was off to a beach for a couple of hours followed by relaxation back at Pano Gitonia and then dinner. The only thing that was really different was the beach and the restaurant. After breakfast we said our goodbyes to Thania, Lola and Georgio and loaded all our bags on Georgio's jeep for the drive to the port. We were on the short 45 minute Highspeed ferry to Katopola in Amorgos. We rented our cars and drove the half hour to Aegali and Pano Gitonia. Every bit as wonderful as we remember. The days are becoming somewhat repetitive - sleep in; a leisurely breakfast; worked on the travel blog; to a beach for a swim; back for some more relaxation, and then today into Chora and then beyond to Aneplora, a restaurant on the west side of the island reported to have great sunsets. Today, again after lengthy, relaxed breakfast we hiked the path over the top of the island to Pori beach, an absolutely stunning crescent shaped sandy beach on the north-east side of the island. After a refreshing swim we enjoyed a nice lunch at Kalofego, returned to the sea for another swim and then took the coastal walk past the other beaches to Pambelos Lodge. A pretty quiet and pretty much do nothing day. A leisurely breakfast; work on the travel blog; a trip down to the second beach (Platia Pounta); a nap and then a return to Finikas for dinner. The day started with a delicious extensive breakfast followed by a trip into town to pick up a few supplies (milk for coffee; wine etc). Then it was down to Fanos beach for a swim (the sand and water is wonderful) before returning to welcome Bill and Linda, who are joining us for parts of this trip to Greece. Today we left Faros Villas and Naxos driving to Naxos Town where we returned our rental car, wondered the harbour for an hour and then caught the ferry for Koufonissi and our return to Pambelos Lodge. Today we drove through the interior/mountains of Naxos, stopping in a few nice towns. We had very good lunch at a typical tavena in Koronos before circling back towards Naxos Town and then back to Faros Villas. Another primarily recovery day. A bit late in rising, but not so late as to miss breakfast, a dip in the pool, a nap and then a drive around the south-west of the island, before another nice sunset and dinner. After a long day of travel we are here - in Naxos, where the sun is shining, the wind is blowing and the temperatures are high. A short drive to the south of Naxos brought us to Faros Villas, our 'home' for the next three nights. It is off to Spain for three and a half weeks - first five nights at Cortijo El Guarda, a cortijo we have been to twice before and simply love, then east for eight days through Andalusia, the Sierra Nevadas and on towards Valencia from where we fly to Mallorca for nine nights followed by two nights in Barcelona. Lots of walking today. We took the bus to Antoni Gaudi's Park Guell, then walked and visited his Sagrada Familia, then walked back to our hotel, then walked to dinner, then walked back, seeing lots of Barcelona in the process. Photos of Park Guell, Sagrada Familia and dinner at Spain 2017 tab. Travelling day although with a 5:00 pm flight there was no rush. A leisurely breakfast; a chat with Marc; a visit to a glass factory and on to the airport. Then it was a short 50 minute flight to Barcelona where unfortunately the taxis were on a one-day strike. Public transit to our hotel and then out to eat - typical Catalan tapas. Early afternoon we took a drive to a glass factory near Campanet in search of a Mallorcan olive oil pitcher. Unfortunately the one we found was too large so we returned empty-handed other than some photos of a fellow picking cherries, some sheep and a windmill. We went all out and had an enjoyable dinner on our last night here at Son Palou. We spent our first full day at Son Palou in Orient. After breakfast we took a walk through the village (it is really quite small) then circling back to Son Palou. We had a pitcher of sangria in the afternoon and another nice dinner. After three wonderful days we left Muleta de Ca S'Hereu first stopping at the market in Soller. Then back along the scenic north coast with a short stop in Valldamossa, eventually to Orient and our final stop in Mallorca, our return to Son Palou. We did drive down (and back up) the snaking road (see photo at Spain 2017 tab) .in order to stroll through Port Sollers. As touristy port towns go it was actually quite nice, with a tram that runs to Soller, about 6 kms inland. The afternoon was again relaxing at Muleta followed by another nice dinner. Both because this place is so relaxing and wonderful and who would want to drive down and up that road when there was no need we decided to simply stay at Muleta all day, lounging around at the pool and comfortable seating areas leading to another nice dinner. After three nights it was time to move on, to Port Soller on the north coast. Our relatively short drive took us back to the outskirts or Palma, through Valldamossa, along the dramatically scenic north cost past Deia and on to Port Sollar and our lodging for the next three nights Muleta de Ca S'Hereu. A pretty similar day to yesterday - breakfast, a leisurely morning at the Finca, and then an afternoon drive to the south-east of the island, to the beach at Cala Torta where the water was warmer, a stroll through Arta and then back to the Finca. We spent the morning and early afternoon at our Finca after which we took a drive to the coast, first through Campos then on to Cala Figuera and a beach at Almondine. We returned to Cala Figuera for dinner and then returned just before dark. Today we are off to Mallorca. After breakfast we drove to Valencia from where we flew to Palma de Mallorca. We picked up our rental car and made our way to Porreres and Finca Son Jorbo where we will be staying the next three nights. Breakfast was served on the terrace overlooking the valley - very nice. In the early afternoon we went up to the castle after which we drove to the coast - Benidorm and Altea, through endless nispero orchards before returning for our special dinner of 11 tapas. After another filling breakfast Llanos provided us a tour of the citrus grove with explanations and tastings of the fruit. We then drove up the valley, through many more citrus groves and then further east in to Valencia and Alicante provinces. At Alcoi we drove back in to the mountains to our stop for the next two nights, El Castel de Guadalest where we enjoyed yet another wonderful meal. After breakfast we left on our longest drive - nearly 300 km. The first hour was slow through the mountains but then some good highways had us make time so that we arrived at La Joya del Valle de Ricote for our 'Magical Moroccan Night' mid afternoon. Another quiet day. After a nice breakfast we strolled through the sleepy village of Mairena. Late afternoon we went for a driver through the valley, stopping for a drink/tapas at a recommended place with great views of the mountains from the terrace. Photos of the stop and others of the day at the Spain 2017 tab. After our do it ourselves breakfast and a stroll through the property we left for a twisty turning undulating drive across the face of the Sierra Nevada mountains, just below the edge of the protected Parque Natural, eventually making our way to the village of Mairena and out stay at Las Chimeneas. An easy day started with a short trip to Pitres to pick up some stuff for breakfast and then a late afternoon drive up a gorge to Trevelez, the ham curing capital of Spain. Photos and more at the Spain 2017 tab. After only a quick one night stay we left the Cortijo del Marques driving south through Granada along the west sidd of the Sierra Nevada mountains and then along the south to the village of Pitres and Cortijo Prado Toro. Finally the weather gets nice enough to have breakfast outside and we have to leave. We drove straight east to Granada and then 20 km north for a one-night stay at Cortijo del Marques where we stayed in 2013. Where is the hot Andalusian weather? Another cool, cloudy day with prospects of rain. We spent the afternoon driving through the mountains down to the coast (where it was sunny and hot), then circling back to Ronda and El Guarda, where we again enjoyed a nice dinner. The weather again today was far from great - mid teens with intermittent rain. We went into Ronda for the afternoon where for the most part the rain held off. The weather has taken a turn for the worse. It was cool (mid teens) with some rain today but we did get out for a drive but chose not to go into Ronda due to the weather. Just the same some nice flower photos at the Spain 2017 tab. A recovery day hanging around El Guarda with a great dinner at Polear in Alcala del Valle. Unfortunately our luggage has not yet arrived. Our journey was a mess with flight delay after flight delay, undelivered luggage and a very late (11:30 pm) arrival. But we made it - which at one point did not look likely. Details of our changing flights and struggles can be read on the Spain 2017 tab. This journey takes us to Costa Rica, where we visited February 5th through 22nd. We have been before, but each time to the north. This trip was south to the remote Osa Peninsula. We spent time in the cloud forest and on the coast. As expected the reliability of Internet / WiFi was sparse, particularly early in the trip. As a result we were not able to publish our travel blog as we went along. However we are now working away at it. Unlike past trips where we reported day by day here we will comment by stop, e.g. the first posting covers our three days at Santa Juana Lodge. Bye, bye heat and coast. At Dominical we headed inland to San Isidro de El General and then north to the cloud forest and a 'birding' lodge where we went in search of the resplendent quetzal as well as enjoyed the numerous hummingbirds. See some of their photos at the Costa Rica tab. We left Lookout Inn and and Osa Peninsula, returning north to Ojochal, where we stayed at a small but very nice five-room boutique hotel, complete with pool, restaurant and live music. We enjoyed simply sitting on our balcony, watching the birds and the sunsets. Pura vida. From wilderness to more wilderness. A 46 km drive along a gravel road brought us to Carate on the west side of the Osa Peninsula - again only solar power. We enjoyed four days at Lookout Inn, consistently hearing and observing the crashing waves, the birds, reptiles, bugs and animals (monkeys, coatis and a tapir). A relaxing friendly lodge providing a great experience. For the next four days we were 'off the grid', so much so that we had to take a boat to the lodge. Saladero is pure wilderness on the primary rain forest and the shores of the Golfo Dulce. We enjoyed swimming in the warm gulf waters and hiking the short trails in search of wildlife. The food was great, the hospitality great and the other well-traveled guests very interesting. Today was a travel day. From Santa Juana Lodge we drove back to the coast, through Quepos and then south past Palmar and on to the Osa Peninsula where we stayed in Puerto Jimenez in order to catch both the next morning. A very early departure had us arriving in San Jose mid-day which allowed us to drive a few hours south to reach our first destination, Santa Juana Lodge in the foothills of the cloud forest. Time to come home. After 25 days today is a quick breakfast, a 1 1/2 hour drive to Rome's Airport, a flight to Montreal and then another to Halifax. Check out the Sicily 2016 tab for memories of and a summary of our trip. Unfortunately the weather was not great our last day with intermittent showers. We caught the tail-end of the monthly fair in nearby Osteria Nuova, relaxed at Colle Cesoni, had a great chat with Giovanni and Anna Maria and enjoyed a final pizza. We left Sicily today. After a quick breakfast we drove the one hour to the Palermo airport for our hour or so flight to Rome. From Rome we drove 1 1/2 hours into the hills to the town of Casaprota where we will be our final two nights. We ended up at an event in the town square in the evening - a nice way experience. We spent most of the day at the winery, relaxing including time around (although not in) the pool. We did take a short drive around the area before a very memorable dinner. After three nights we left Susafa, enjoying a scenic drive north-west through the mountains and rolling hills towards Palermo where we are staying at a vineyard approx. 40 km south and still in the rural hills. Most of the day again at the Masseria although we did go out for a few hours in the afternoon, driving north through the Monti Madonie and then on to the coast before returning. When you are at a really nice place and out in the country along a less than great one lane road 20 km from the nearest town it is not a particularly tough decision to stay put and simply relax. We did. Another not so great day weather wise. Not having gone in to Piazza Armerina we did so before leaving the area, taking a short walk through the center of town and popping in to the cathedral which was quite impressive. We then drove north through more rain and a whole lot of nothing up into the mountains and eventually to the Masseria Susafa where we will be staying the next three nights. One of the primary 'must see' sites near Piazza Armerina are the mosaics at the Villa Romana del Casale. We sent an hour or so (that's what it takes) viewing the multi-coloured mosaics dating originally from the fourth century AD. Shortly after returning to our B&B it began to rain, and rained throughout the rest of the day precluding any other excursions. On the advice of Francesco we decided to bypass Modica and head to Ragusa Ibla where we spent a couple of hours including lunch. We then continued north past a number of similar looking towns (high on hill tops, extremely dense with homes and churches) through rolling countryside to Piazza Atmerina. Today we went to another Baroque town - Noto. Devastated by th 1693 earthquake it was rebuilt and recently restored to be a showpiece of architecture. We then drove south to the south-east tip of Sicily and then back to Pozzallo along some beautiful sandy beaches. More at the Sicily tab. In the afternoon we went to the nearby town of Scicli. Located in a gorge the town is very pleasant to walk through with nice plazas and some fascinating buildings. We then went down to the beach for a nice stroll before returning to Scicli for dinner. Before leaving Fattoria Vassallo we got the full tour of the farm from Salvatore. Animals, vegetables, nut trees, vineyards, fruit trees - we saw them all. We then drove primarily along the coast, first through some not so attractive greenhouses but then some nicer beach-side communities before heading somewhat inland to Villa Quartarella, a few kms south of Modica. After another leisurely morning we went to the coast to a cove/beach Salvatore recommended where we spent a couple of hours on the beach. Afterwards we went into nearby Licate to wander the centro before returning to the farm for another filling and great meal. Today was our longest driving day, from Marsala south and then west. After the city of Marasala it was primarily vineyards and olive groves. We did stop for a couple of hours at the ruins of Selinunte - very impressive, before continuing on to the organic farm at which we will be staying the next two nights. We spent the day along the salt-pans in the lagoon just north of Marsala, including a visit to the Museo del Sale, housed in a windmill used in the day for moving the salt water from one lagoon to another. Although we knew it would be crowded (and it was) we returned to the Riserva Naturale dello Zingaro and hiked the (difficult) 1 km or so to the first beach, the Cala Capreria. We then left the area, driving through rolling hillsides often covered with vineyards to the west coast and Marsala, our stop for the next two nights. Today we stayed in the area. We tried to go into the nature reserve but a brush fire closed the park so we found a nearby beach where we spent a couple of hours in the sun and beautiful sea. Then some time simply sitting in the village square, watching the people, including two more weddings and an early dinner. After a nice breakfast we drove across the mountains to the west side and the town of Erice where we wandered around for a couple of hours. We then drove to the very north of the peninsula and the seaside resort of Son Vito Lo Capo before returning for dinner again in Scopello. Our last morning at La Casa dei Fiori before flying to Sicily (Palermo) to pick up another rental car and drive the approx. one hour to Scopello, on the north-west part of the island. And yet another quiet, mostly lazy day. In the afternoon we took a drive along the north coast and then to the Specchio di Venere or Venus' Mirror, a small lake in a former crater. We continued inland across the island, ending up in Scauri (it seems all roads lead to Scauri). Then back to Tracino where we enjoyed another wonderful meal courtesy of Carlos. Much the same today - the morning lazing around La Casa and then an afternoon drive across the interior to Scauri where we were unsuccessful in finding a place to eat. We returned again along the east coast and picked up a couple of pizzas and a calzone to eat on our terrace. After spending the morning and into the early afternoon at La Casa dei Fiori we went for a drive around the south-east end of the island - a spectacular drive with the sea always present. After Scauri we continued on to the town of Pantelleria and after a short stop returned to Tracino, essentially driving around the entire island. The first of what will no doubt be a number of relaxing (lazy?) days. We are in a wonderful place with a large terrace looking out to the sea. A comfy hammock for Gayle, decent Wifi access, warm weather, and a pool - not much need to go anywhere at least not today. We left mid afternoon for Toronto and an overnight flight to Rome from where we caught a one hour flight to the island of Pantelleria, located between Sicily and Tunisia (closer to Tunisia) in the Mediterranean. During our five days on the island we will be staying at La Casa dei Fiori (The House of Flowers) . Our next trip is to Sicily. Gayle spent some time on Sicily during her year of travelling in 1974/1975 while Norm has never been this far south on any of his trips to Italy. 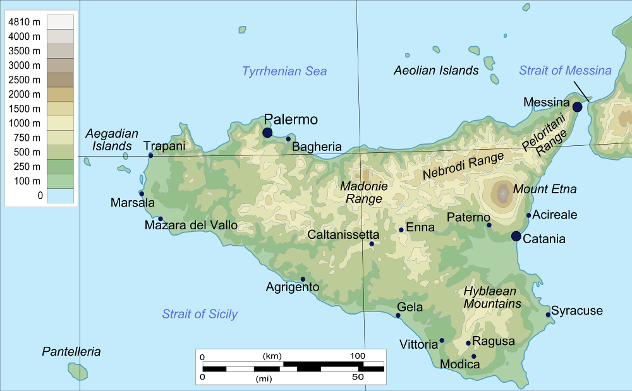 The trip begins with five nights on the island of Pantelleria, an island in the Straight of Sicily between Sicily and Tangiers, actually closer to Tangiers than Sicily. No particular reason for going to Pantelleria other than it qualifies as being 'off the beaten track'. Apparently the food is supposed to be very good. Then it is back to Sicily for two and a half weeks, from Palermo to the west side near Trapani, then south with a couple of nights in Marsala, along the coast past Agrigento as far as Modica and then through the interior, i.e. between Caltanissetta and Enna back to Palermo. In spite of two and half weeks we will not be spending any time along the east coast and although not staying on the north coast we will likely do a day trip. Rather than leaving Palermo on an early morning flight we will be leaving mid-day to Rome where we will then head about an hour and a half north-east of Rome for our last two days. As always the ability to keep the travel-blog current will be dependent on the speed of Wi-Fi access. Photos can take some time to upload. Check back regularly to see if an update has been posted. Being Gayle's 60th birthday we decided to take a special winter vacation - to Hawaii. We stopped for three nights en-route near San Francisco before continuing on to the Big Island. A great 2 1/2 weeks. The few days south of San Francisco was a great decision. Not only did it break up the long trip the Monterrey Peninsula was an interesting visit. Spending two weeks on the Big Island was also a good call - relaxing with the opportunity to explore the whole island. See the Hawai'i 16 tab for a full report. Our last day. We enjoyed yet another filling breakfast and of course outdoor showers in the lava rock enclosure. We made it (just in time) to the Seahorse Farm tour and then a final dinner before returning to the airport to catch our late night flight to LA, then on to Toronto and finally back to Halifax. Same old; same old. The morning was again spent enjoying the Ka'waa Loa Plantation property, including the outdoor lava shower. In the afternoon we went north of Kailua-Kona to a state park known for its sea turtles ... and it did not disappoint. Another morning spent on the lanai soaking in the quiet and the panoramic view to the coast. In the afternoon we drove 10 miles along the old highway and what is the Cultural Heritage Trail. Unfortunately being a Monday most of the craft shops were closed but a nice drive the same. We returned along the coast with a stop to watch a number of surfers. So here we are again enjoying our morning at our 'plantation' on the lanai overlooking Kealakekua Bay. In the afternoon we spent some time snorkeling at a place called 'Two Steps' and then went to Pu'uhonua o Honaunau National Park, a 'city of refuge' and place of royal grounds. We left Waipio Rim, crossing the island with short stops in Waimea and Waikoloa to take a few photos of the crosswalk flags, and then on to the coast and south, past Kailua-Kona to Captain Cook where we will be staying at the Ka'waa Loa Plantation our last four nights..
Our last full day in Waipi'o was spent in its entirety at the B&B, doing nothing but sitting on our terrace, enjoying the vistas, reading, working on the blog, and simply relaxing. This may sound somewhat boring but for us it is why we came to Hawaii, to sit back and enjoying without racing around, driving everywhere. The morning was a repeat of yesterday and the day before - leisurely hanging out at our B&B, enjoying the breakfast (a fruit try and cheese omelet with freshly picked avocado and tomato. In the afternoon we drove over to Waimea and then through ranch country to the very north of the island and Hawi. We returned along the Kiohala Coast with brief stops at two beaches along the way before crossing back to Honoka'a and Waipi'o. Same old same old - wake up to the sun and sound of the surf, laze around, enjoy a creative and tasty breakfast, work of the travel-blog, check emails, noon passes, finally get up and out. Today we drove back down the Hamakua Coast to the Hawai'i Tropical Botanical Gardens and then inland between the two large volcanoes - Mauna Loa and Mauna Kea, before stopping for dinner in Waimae. Today is Gayle's birthday - 60! And we spent it doing essentially nothing. Now that may not sound very exciting but we are a such a wonderful place with a jaw-dropping panoramic view of the valley and ocean below that there is not much incentive to leave, plus there is not much near by. So for the most part we stayed put and enjoyed a relaxing day here at Waipi'o B&B. We did make the trip in to town to check out a few of the shops and pick up some food for dinner. We left Volcano east across the bottom of the island to Hilo where we stopped for lunch. It was then north along the Hamakua Coast, including a short but spectacular scenic drive along the old highway through lush jungle and beautiful coastline, eventually reaching Waipi'o Valley where we will be staying the next five nights. Two relatively do nothing days here in Volcano and the National Park watching a few films in the Visitor's Centre, stopping at the steam vents and then seeing the Halema'Uma'U Crater in the Kilauea Caldera both during the day and then again at night when the orange colour of the reflecting lava bed was particularly impressive. After enjoying another great breakfast and receiving many helpful suggestions from Dave and Wendi we left Honu Kai and drove around the south-west corner of the island, eventually making our way to Volcano where we will be staying for three nights in a cabin just outside Volcano National Park. After a wonderful breakfast we drove up the coast to Dave and Wendi's other property at the Mauna Lani Resort where they not only rent out their condo but provide guests access to the beach. We took advantage of the opportunity for a great afternoon of swimming, snorkeling and relaxing. We returned for dinner at the Kona Inn, with a great setting on the water providing for a wonderful viewing of the sunset. For the most part a travel day. Early to rise, an hour drive to San Francisco for a 4 1/2 hour flight directly to Kailua-Kona. We easily found our B&B the Honu Kai where we were greeted with a Hawaiian laid-back welcome. Although it was drizzly and cloudy early in the morning the weather quickly improved such that we decided to go to Ano Nuevo State Park and take the tour to see the Elephant Seals that return to, give birth and breed on the shore/beach. It was a very worthwhile tour, informative and interesting as well as being a nice hike. Afterward we drove through the redwood forests of the Santa Cruz Mountains and along Skyline Ridge at the top of the mountain range. Photos, mostly of the elephant seals, at the Hawaii 2016 tab. We awoke to a beautiful sunny day. The plan was to drive down to the Monterey Peninsula, approx. 1 1/2 hours (although it took somewhat longer with the numerous photo stops) to wonder around Monterey, take the 17 mile drive by all the famous golf courses (Spanish Bay, Cypress Point, Pebble Beach etc.) and then on to Carmel Bay. We enjoyed a long but wonderful day, the drive surpassing our expectations. Up real early for a 5:50 am flight to Montreal, and then on to Chicago and finally San Francisco. We were somewhat concerned about making our somewhat tight connections, particularly after deicing both in Halifax and Montreal, but thanks to the Nexus card that helped us get through US Immigration we made each flight, arriving in San Francisco as scheduled. After landing we drove about an hour south to the farming town of Pescadero where we 'Chicked In' to the Pescadero Creek Inn - our home for the next three nights. We went out to the well know Duartes Tavern for dinner and then back to call it a day, in spite of it being only 6:30 pm Pacific time. We have now completed our Memories of and Faces of Morocco. Please go to the Morocco 2015 tab for the summary of our trip. Our last day in Marrakech. We got out late morning to visit the Majorelle Gardens. When a garden is the number one tourist attraction in a city you know Gayle will insist on visiting. The gardens were actually very nice, deserving of its praise. Contained within was a superb Berber museum. We then returned to the Riad where we had a lengthy chat with some British travelers before going to dinner. We returned and finished packing for our early morning departure. For more please go to the Morocco 2015 page. For those really interested here is our tour itinerary. Another pretty much do-nothing day, mostly spent at Riad Al Bushra. Late afternoon we went out into the Medina and souks, ultimately passing through the Jemma el-Fnaa square - location of the snake charmers. We then continued on to dinner. Most of the day was spent at Riad Al Bushra. We expected to need a day to re-energize ourselves and right we were, even more so with me still coughing and sniffling. I worked on the travelogue, we both had a nap, and relaxed dipping our feet in the plunge pool - very nice in the heat. Late afternoon we went out to an artisan complex and dinner but otherwise it was a very low-key day. Another relaxing morning at the Riad, after which we left for Marrakech. The drive is flat and direct. A few short stops and we arrived late afternoon. We enjoyed one final mint tea with Amar as we reminisced about our three weeks traveling together, afterwards saying our goodbyes. It was with sadness that Amar left. A relaxing morning at the Riad, a few hours in the very nice small port city of Essaouira and then a swim and some time in the sun. Dinner included a nicely prepared fish, appropriate in this fishing community and a pleasant chat with a couple traveling from London. We left Taroudant traveling west to the coast and Agadir, a city we passed by. It was then norhtn along beautiful coastline with stops for bananas, another grill and a demonstration of the process for using the Argan nuts to make oil. Late afternoon we arrived at a beautiful Riad south of Essaouira for the next two nights. Two trips to the Medina in Taroudant - known as the 'little' Marrakech. We did do some shopping in the morning - a frustrating negotiating process, then returned to the riad for a relaxing afternoon, including a swim. We then returned to the Medina just before sunset to experience the craziness of the streets and square in the evening. We left Tafraout driving through more wonderful mountains and landscapes until we stopped for lunch in Igherm. A busy little of town we joined Amar for chicken grill. It was then on to Taroudant, where along the way we did see the goats high in the trees eating the Argan nuts. Our riad just outside of Taroudant was an excellent recommendation of Amar, an orange and banana farm with views to the Hihg Atlas mountains. A 'down' day. In the late morning we went out into the countryside to see some 'painted rocks' - really they should have been left natural. During our travels we were fortunate enough to see a group of gazelles. We returned to Tafraout to just wander around for a couple of hours and then back to Chez Amaliya for a relaxing afternoon and dinner. Some spectacular and varied scenery today, from the flat desert to a dramatic valley, the Ait Mansour to landscapes that reminded us of both Arizona (without the cactus) and Peggy's Cover due to the granite rocks perched upon each other. We had a nice stop in the village of Akka, again buying treats for the children. A lot of driving (over 300 km) but a drive that always had our attention. Mostly driving today, mostly through the desert. Our timing was good when we came upon a herd of camels crossing the road. When we arrived in Tata, a small town near the Anti-Atlas Mountains just outside our stop for the night a wedding was taking place - with food and song. Apparently it was only the first night of a four night celebration. Our stop was very unique, a 500 year old Kasbah with a ton of character. A relatively easy day today with a trip up the valley, passed more caves (some with people still living in them) to the village of Telouet and the Kasbah Telouet, a very well preserved Kasbah with particularly impressive mosaics and tile work. We then continued in a counter-clockwise circle through some beautiful landscapes, eventually returning to our Riad for a restful afternoon and antoher nice dinner. First on the agenda was a visit to a nomad family of 12 still living in a set of four caves. We were welcomed to tea and met half the family including young Abdul who welcomed the soccer ball we brought him. A scenic drive brought us to the oasis of Skoura where there are apparently 300 Kasbahs. It was then on to Ouarzazate - through an intense hail storm - where we visited a Berber shop, ultimately buying a couple of small carpets. Rather than staying in Ouarzazate, a reasonably large city we drove 45 minutes north to the village of Tamdakhte where we will stay the next two nights. We started the day with a tour of the palmerie just south of the Todra Gorge where we were shown the irrigation and resultant extensive variety of fruits and vegetables. After a walk through the kasbah, and a display at the carpet co-operative we walked the short but steepest portion of the gorge. It was then a short drive to the Dades Valley, which we drove through seeing a considerable number of kasbahs on the 'route of 1,000 kasbahs'. Primarily a driving day. Amar is also not feeling great so it was understandably lets get from A to B. That said there was not much between A and B. Across the desert, a Berber village, more desert, palm trees in an oasis, more desert, a few villages, more desert and then the road to Tingher where we did encounter a number of massive kasbahs. Stayed in a riad run by with a nice couple. Ok, actually Riad Nomad but this is truly beyond nowhere. The entire day was spent by ouselvees in the riad - no internet ; nothing to do but listen to the silence. Not for everyone but we actually kind of enjoyed it. And sleeping under the stars was nice. After breakfast we left the camp, again having the pleasure of Bob and Jimi transport us across the dunes. After freshening up at the Riad we left for the a couple of days in the outback desert. Merzouga and the dunes is a great experience but if one really wants isolation, i.e. feeling like the nomads a trip to M-harch is in order. We took the 45 minute drive from Merzouga to Rissani where we spent an hour and a half wandering through the extensive souk (market), even larger this week due to the selling of the sheep for the upcoming day of sacrifice. After some quiet time at the riad we drove out to the far side of the desert where we met our camels for the one hour trek to the overnight camp. After breakfast we circled behind the large sand dunes of Erg Chebbi to visit with a nomad women and her home. Nearby was a well with camels present. A couple of nomads, withe the help of Amar spent some time cleaning sand from the well. We then visited the Gnawa people, originally slaves from Sudan for both a performance of their traditional music and their Berber pizza. We left Fes for a very long drive, first through the mid Atlas mountains and their cedar forests - visiting some Barbarian apes along the way - then through the Ziz Valley before continuing further south. We stopped to see the fossils of the area, and ultimately did not arrive to Merzouga and the Erg Chebbi (sand dunes) until after dark. Today was spent in and around Fes. During the morning/early afternoon we were taken throught the Medina by a guide (otherwise we surely would have gotten lost) and then in the afternoon to a ceramic factory and the Palace gates. Then some time to relax before another excellent dinner at our Dar. We left Chefchaouen this morning driving south the Fes. Our first was a village market. Then it was on to the roman site of Volubilis where we stopped to wander around the ruins dating form 225 BC, followed by the city of Meknes and then on to Fes where we will stay for two nights. Today was spent in Chefchaouen, mostly walking the blue painted alleys of the medina. We went just outside to see the women washing carpets and clothes in the mountain stream and enjoyed drinks in the square while watching people. After a visit to the castle we had dinner at a local cafe. After (another wonderful) breakfast Omar arrived to begin our tour. Before leaving Rabat we stopped at the Mausoleum Mohamed V before driving two hours north to the what was originally a Portuguese town - Asilah. Here we strolled through the medina and stopped for a drink before continuing north and then west, just south of Tangier, along the Alboran Sea and into the Rif Mountains to Chefchaouen. A long day in the vehicle but quite a nice drive, particularly along the Mediterranean coast and through the mountains. After a late (yes we slept in) breakfast we relaxed, starting the travelogue and chatting at length with Mohamed. We then wandered through Rabat, including the cemetery, kasbah, and medina. After the 'cooker' offered to make Gayle a vegetable tagine there was no question we were going to again eat at the riad. The reward of a long day of three flights is the enjoyment of spending an afternoon / evening in a our first riad - Riad Zyo, an oasis in the medina of Rabat. Ali, the owner spent considerable time chatting with us after which we enjoyed a wonderful dinner in the riad. A great start to the trip. Up early, a quick breakfast and then to the airport for what turned out to be over 24 hours before finally arriving home. Not a particularly rewarding day but the cost of vacationing in Greece, a minor cost in the grand scheme of things. Time to leave Kefali and spend one night in Chania before flying home. We stopped in Kefali for an orange juice and Elos for a coffee with the stone / wood carver and then drove the hour and a half to Chania. Our Bed and Breakfast is right on the harbour of the old town which put us right in the middle of the actions, which was both good and bad. We chose well and enjoyed a very nice final meal. Yes it is getting repetitious but another glorious day, the first half of which was spent enjoying breakfast and the sun shining on our terrace. Later in the afternoon we went to Elafonisi beach, the 'best' beach in Crete, approx. 16 km away. The beach is quite spectacular - very sandy with shallow water, an enjoyable place to spend a couple of hours. Another relaxing morning at our guesthouse before heading out to a couple of coastal towns, enjoying the scenic drives and swims at both. On the way we enjoyed an interesting experience when we stopped in to an olive wood shop in the village of Elos. This is a nice place, with a great few of the opposite side of the gorge, so we enjoyed it making a late breakfast and relaxing. It was not until 4:00 pm that we forced ourselves to go for a drive down the gorge to the coast and then on to the village of Sfinari where we enjoyed a swim and dinner. Another travel day without a lot to see or describe of the drive between Samonas and Kefali - in the mountains of the south-west of the Chania region of Crete. So today is all about Samonas Traditional Villas where we enjoyed three wonderful days. We're getting better - out by 1:00 pm today for a drive first east along the north coast then inland and across the mountains to the south coast and the area around Frangocastello, then west to the seaside village of Chora Sfakion and then back through the mountains again. We enjoyed our house here at Samonas before eventually getting out late afternoon for a drive through a few villages, down to the coast and then back into the mountains for a meal at a well rated (and based on our meal well deserved) restaurant. Our longest driving day from Anatoli, through the mountains down to the coast, then west along some very attractive coastline, then inland (where it dumped rain), again through the mountains to the north coast and Rethimno, further west towards Chania before finally back up the mountains to the village of Samonas. We took a circular drive, first further up into the mountains, then to the Libyan Sea, along a scenic coastal road to the sea-side village of Tertsa, where we had lunch at a taverna on the beach. We then drove into Ierapetra for Gayle to see the town where she stayed over 40 years ago. After a similarly nice breakfast we visited the animals, said our good-byes and left the mountain. After a frustrating hour driving unmarked roads, unable to find our route south we decided to take the national road to Agios Nikolaos to make up time. We then headed back into the hills through Kritsa and then south on a very scenic drive to Anatoli, a traditional village high above with views of the Libyan Sea. We enjoyed a stationary day here in the Crete mountains - after all it is an 8 km drive through the mountains to the village. The furthest we strayed was a short walk to a nearby church. We enjoyed what will no doubt be our most memorable meal and evening of the trip, spent along with two families from Cyprus listening to Giannis play his lute and sing traditional Cretan songs. Travel day -- up early (5:00 am) to catch the ferry (7:00 am) )to Naxos to catch another ferry (scheduled 3:15 pm but not until 4:15 pm) to arrive in Heraklion (schedule 6:55 pm but not until 9:30 pm) which meant driving up into the mountains in the dark and ultimately not arriving until 11:30 pm. A long long day. Today we visted the Hozoviotissi Monastery, near Chora, literally built into the side of a cliff halfway between the top of the cliff and the sea far below. We then drove down into the largest town Katapola, returned to our apartment and enjoyed dinner at Kamara, the restaurant up the hill from our apartment. Fortunately the weather was somewhat better today - still a bit cool but predominately sunny. As is our tradition it was well after noon before we got out (relaxing over breakfast in a place like this makes getting out early not at the top of our list). We drove the entire length of the island stopping for two short swims and a light meal along the way. After making breakfast in our kitchenette and sitting around for the morning we eventually got out and drove the 15 km through the mountains to the capital village of Chora. Very traditional with many small churches, alleyways, shops and restaurants we had a late afternoon lunch before returning to Aegiali through some heavy clouds. We enjoyed a quiet day today. Not having our car yet we returned to Kamara for breakfast - the fresh orange juice was excellent - and then lazed around, working on the blog. Early afternoon we walked down ... way down to the town where we picked up our rental car and some breakfast supplies. A short drive to a nearby mountain village and dinner in Aegiali and the day was done. We had a late afternoon ferry today to our next island - Amorgos. We could have gone down to the beach but rather hung out on our terrace where Vassiliki dropped by. We had a lengthy chat, learning a considerable amount about life on Koufonissi. Another typical Koufonissi day. Get up, make some breakfast, sit around admiring the view, go the a beach, go to another beach, have something to eat, return to Pambelos Lodge and enjoy the evening with candles and Psimeni raki, the local herb liquor. The annual Fisherman's Festival - what brought us to the island of Koufonissi, not one of the more popular islands (although apparently it is with northern Europeans). We made a nice breakfast in our kitchenette, went for an afternoon swim and then in to town for dinner and the festival. Today is primarily a travel day, with a short 45 minute ferry from Paros to Naxos and then an hour later a 2 1/2 hour ferry from Naxos to Koufonissi where we will be staying the next three days. Today was a funny day weather wise - with rain off and on and then quite cool. But we did drive through the interior to the original capital of Lefkas and walked a portion of the Byzantine Trail. We rented a car for a couple of days, today driving around the island, a total of 55 km, stopping at a few fishing villages and a beach where we enjoyed a swim in the Aegean. Dinner was great in a very nice restaurant overlooking the nearby island of Antiparos. After a long sleep we enjoyed a late breakfast. Clea drove us down to Naoussa where we rented a car for tomorrow and Thursday, wandered around the town, picked up a few supplies and walked back to Petres. We had a short swim, relaxed and I posted the first day of the blog while Gayle napped. We will again eat at Petres tonight. We arrived in Paros on schedule, met at the airport (the smallest airport we have ever experienced) by Clea of Hotel Petres who provided insightful commentary of what Paros has to offer on our 25 km drive to the hotel. After getting orientated we enjoyed a great dinner before crashing. Further details and photos on the Greece 2015 page. Our flights take us to Toronto, then overnight to Athens followed immediately by a connection to the island of Paros, our first stop for four nights. After breakfast it was off to the airport in Lisbon from where we caught our SATA flight to Toronto, with a two-hour stopover in Ponta Delgada, Sao Miguel, Acores. From there we flew to Toronto where we stayed overnight with friends. Our last morning in the Algarve and then it was off on a lengthy drive over the Serra de Monchique and then north to Palmela. Upon arriving we were surprised to enter a Medieval Festival in not only town but at the Pousada. This made driving through the throngs of people challenging but slowly we made it. We then joined those same crowds to experience some of the festival. Staying at such a nice place we pretty much stayed put, enjoying the pool and the views. After a nice breakfast overlooking the sea we enjoyed a swim and the nice weather. We did take a walk along the cliffs to the one beach and a few restaurants but in the end decided to pick up some ham, bread and cheese, a pizza and a bottle of wine and eat at our place. Today we drove most of the Algarve, along the slower national road - which was not all that exciting. We stopped for a short while in Tavira, a nice town and then continued on to Portimao where we have a nice place to stay with magnificent vistas of the sea, beaches and cliffs. Unfortunately we had to leave Cortijo el Guarda and Spain today, not that we rushed out. After saying our goodbyes we drove up to and through Seville and then west to Portugal, passing many orange groves along the way. Castrol Marim, a quiet sleepy town in the first one encounters after crossing the border. We quickly found Casa Rosada a nice small three room B&B with a beautiful garden and accomplished cook. Another so-so weather day - very cool for Andalucía this time of year. But it did result in us spending most of the day at the cortijo just relaxing and resting. We went out for a drive later in the afternoon during which it ... yes rained, and pretty hard for a while. But it cleared up for the last half of the drive, with the sun actually coming as we were returning to the cortijo. We enjoyed another nice dinner with Hans, Miranda and the other guests. A bit of a strange day. After a nice breakfast the weather turned cold with showers off and on. As a result we just lounged around our room until late afternoon when we went out for a short drive to the nearby 'pueblos blancos' or white villages, before having dinner in Alcala del Valle. Photos and commentary on the Spain 2014 page. Today we head south-east, past Seville to the Cortijo El Guarda where we stayed for one night during our 2013 trip to Spain. We so much enjoyed the cortijo, the hospitality of Miranda and Hans and the fantastic dinner we are returning for three nights. Another 'down' day we stayed at the molinos in the morning and then went out for a drive to some of the nearby villages in the afternoon. We returned just before the rains, and in this case heavy rains began. We again ate in the village to end a quiet day. Today should be our longest driving day - slightly over 300 km south-west from Guadalupe, generally through flat plains into Andalucía and the village of Fuenteheridos where we will be staying two nights at was once an olive mill. Breakfast, lingering in the amazing Parador de Plasencia and then on the road south to Guadalupe. A generally scenic drive in part through a national park brought us to the interesting town of Guadalupe, with its impressive cathedral, Parador and other historic buildings. Another so-so day weather wise. For the most part is was overcast with a few showers although at times the sun shone through with blue skies. We left Ciudad Rodrigo for the 150 km drive to Plasencia. Our route took us via La Alberca, an interesting old town in the hills. Although threatening rain we stopped for a walk about town. From there it was across a mountain ridge and down the other side to Plasencia. A simple and quiet day here in Ciudad Rodrigo. We wandered through the narrow streets of the historic - inside the castle walls and moat - town. Showers off and on kept us close to the Parador were we relaxed most of the day before going out for dinner. We left Alfonso and Finca La Ramallosa with short stops in a Trevejo and San Martin de Trevejo, a couple of small villages/towns he recommended before continuing on to Ciudad Rodrigo where we are staying (at the historic Parador) for a couple of nights. Today was a real do nothing day as we stayed put at Finca La Ramallosa. We went for a nice walk to an abandoned hamlet but otherwise not much else ... and it was nice. Today was supposed to be a short day but turned out anything but - actually the most kms driven of any day to date. The reason, rather than driving straight to Spain we decided to go through the Serra da Estrella mountains, the highest in mainland Portugal. As you will see in the photos on the Portugal page we were fortunate to encounter a number of shepherds on what was a scenic drive. We then drove east crossing in to Spain and the finca that will be our home for the next two days. We left Flor da Rosa for a drive essentially straight north ultimately to Belmonte, another Pousada - this one originally a convent in the hills south of Belmonte. We detoured a bit to visit two interesting towns - Idanha-a-Velha and Monsanto, the first very small but with some interesting roman ruins and Monsanto a nice hilltop village of stone homes; narrow alleys; elderly ladies selling the traditional Monsanto doll and a great roof-top terrace overlooking the valley. We finished the day enjoying an excellent dinner at Belmonte. Staying two nights at the Pousada here in Flor da Rosa today was intended to be a leisurely day. Ultimately we did go out for a drive that took perhaps longer than expected but during which we did visit two interesting towns. We returned for another dinner at the Pousada. After breakfast we wandered about the Castello de Palmela before heading inland through the Alentejo to Estremoz where we stopped for a while before continuing north beyond Crato to Flor da Rosa where we will be staying for two nights at the Pousada. Flying SATA airlines a Portuguese carrier based in the Azores we connected through Toronto with an overnight flight to Ponta Delgada on the island of Sao Miguel, one of the nine Azores islands in the mid-Atlantic. We changed planes, continuing on to Lisbon where we picked up our rental car to drive approx. 50 km south east to the town of Palmela where we stayed at the Pousada de Palmela. This September we are returning to Portugal - 30 years after visiting in 1984 - as well as spending time again in Spain. Technically we will actually be returning to Ponta Delgada in the Azores (where we spent six days on our previous trip) although this time it is only a one-hour touch down for our SATA flight from Toronto. We will primarily be staying at pousadas (the equivalent of Spanish paradors) in Portugal and then a mix of paradors and cortijos (including a return to Cortijo El Guarda near Ronda where we spent a night a year ago). Our route takes us from Lisbon, north through the Alentejo, east into the Extremadura region of Spain, south into Andalucía and then back to the Algarve on the southern coast of Portugal. I will once again be maintaining the blog as best I can as time allows. We awoke to wonderful sunshine our last morning to enjoy another very nice breakfast (we are going to miss those chocolate croissants) under an olive tree. The drive to the airport, including a gas fill-up was both easy and 40 minutes, as promised. From there it was a long day of travelling until we arrived home. Primarily a driving day we booked out last night in the hills north of Nice, approx. 45 minutes from the airport. The first part of our drive took us through a number of vineyards and then across the lower hills of the Alpes-Maritime. We drove a challenging 30 minutes to the village of Peillon, an impressive village clinging to a mountain-top for a nice final dinner. After three nights at Mas Perreal we had to leave, back towards Nice. We scheduled one stop mid-way just outside Brignoles. The first part to the drive was nice, through rolling countryside, of course past lavender fields and past one amazing field of sunflowers. Thereafter open fields of wheat and corn and then some forested areas as we drove south, arriving at the Bastide de Messine near Brignoles. Today we went to another market, this one in Lourmarin. Somewhat larger and in another wonderful Provence village we enjoyed this market somewhat more, and bought a few things. Again we stopped for drinks in a busy cafe, enjoying the nice weather and people (and for Gayle dog) watching. We then went for a drive through the nearby countryside before returning to Mas Perreal for a swim before off to dinner in Saint Saturnin-Les-Apt. Another low key day. After a quite different breakfast - not that it did not have the standard bread, jams, juice and coffee but a fresh fruit plate and fresh picked at the Mas Perreal cherries pancakes were the first 'hot' dishes we have had for breakfast. We then went to Roussillon, approx. 12 km, to the market, returned to spend the afternoon at the Mas and then enjoyed a 'picnic' supper here at our terrace. A shorter day today although we did not get out until after noon. Another lightning and thunder show with buckets of rain kept waking us last night. The early part of the drive was through more lavender fields each as impressive as the last. We then drove east through a couple of larger cities (Manosqude and Apt) before finishing the day by arriving just outside Saint Saturnin-Les-Apt for a stay of three nights. A long driving day today, first out of the mountains through some ski resorts, over the Col de Toutes Aures and on to Castellane, followed by a drive through the dramatic Grand Canyon du Verdun. The last stretch along the plateau above Lac de Ste Croix brought us to lavender land, in full bloom and eventually our beautiful B&B Les Colombiers du Chateau. Today we stayed put, taking a walk through the village (half an hour to see it all) and then simply relaxed at the Auberge, catching up on the blog, planning the next few days etc. Actually really nice to spend a quiet day. The Auberge is noted for its restaurant that lived up to advance billings. Today was supposed to be an easy day. Lots of time to get to the airport, fly to Nice, pick up our car and up into the Alpes-Maritimes to the village of Roure. It was anything but as we stopped for a most enjoyable final lunch but then got twisted around in the mountains cutting our arrival at the airport way too close. Today was mountain driving, through some of the most dramatic landscapes we have ever driven ... and we have been to some pretty dramatic places. It was a tough, tiring drive (and unfortunately I don't get to enjoy all the landscape as focusing on the next hairpin turn is my priority) but very rewarding. We stopped along the way for an enjoyable lunch and spent the evening listening to some excellent Corsican music at our hotel. Another great day. Before leaving Tizzano we took the dirt road around the other side of the harbour that led to a small beach where we stopped for another short swim. Then it was inland, first to the town of Sartene. As unimpressive as Bonifacio was Sartene is a quaint Corsican town with narrow alleyways amongst the stone buildings and a number of nice outdoor restaurants, one of which we stopped at for a small lunch, including a crepe. We then drove up in to the L'Alta Rocca, eventually to the mountain village of Quenza where we were staying the night. The plan was to go to Bonifacio, the noteworthy town in the south-west, do a little shopping and have lunch. But we go side-tracked, finding an appealing restaurant outside Figara. But with time to fill in and the sun shining we went up the coast to a beach. We returned for a very nice lunch and then made our way to Bonifacio, which turned out to be a huge disappointment. We returned to Tizzano for a relaxing evening. After a number of long difficult driving days this was truly a do nothing day. We slept in, went for a croissant and coffee, came back, sat on the balcony, caught up on the blog, napped, went for a walk to the beach, went to dinner and returned. Total distance driven - 0 km. Another travel day again with mixed weather - at times nice and sunny; at times a torrential downpour. But it cleared just as we arrived in Tizzano, a sleepy little town on the south coast. Our hotel, the Hotel du Golfe is located right on the water with spectacular views of the sea. This turned out to be a very long day, with lots of spectacular mountain driving, an amazing drive from Porto to Piana with fantastic views of the Calanche de Piana and then a beautiful drive along the coast before returning to Carbuccia. A travel day, first through the mountains west of Vallecalle and then south, perhaps two thirds of the way down the island to another remote mountain village - Carbuccia. Today was a nice day - perfect for a drive around the scenic Cap Corse in the north-east of the island. Dinner was highlighted not only by the food but the wildest lightening storm we have ever seen. There is a new tab 'Masters' which is the reason for the trip. However we are spending a week before our Masters visit along the coast of South Carolina and now Georgia and will then spend a week afterwards in the Great Smoky Mountains of North Carolina and Tennessee. Taking advantage of a 'last-minute' opportunity we decided to leave the cold and snow for a week in Cuba (first time). Most of the time was spent relaxing at the pool or beach, eating and enjoying some very good music. Staying at the resort the first five days there was not much to photo or write about so no daily blog. But then we decided to hire a driver / guide for a couple of trips the last two days. Very worthwhile we learned a great deal about Cuban life and economic struggles. We stopped at a number of interesting places, including the regional capital of Holguin, the fishing port of Gibara, a local medical clinic and the home of our (second day) driver to see a typical Cuban home and enjoy refreshments from his parents. Upon returning home I decided to post a number of photos, mostly outside the resort - with a focus on the people of Cuba. Buongiorno. We are off (Sept 3) to Italy for a good part of September. We fly into Milano and immediately head to the foothills of the Alps to Lezzeno on Lake Como. Then it is south to Parma (parmigiano cheese and parma ham) and Modena (balsamic vinegar). Driving through the Apennines (a mountain range through central Italy across which I bicycled way back in 1974) we stay at an olive oil resort just north of Florence. We are then in Tuscany for nearly a week, first at what should be an extremely nice B&B near Cortona and then four nights at a farm right in the heart of the wine region of Chianti. This is very near where we stayed in 2006, an area we look forward to returning to and exploring further. Next it is to the coast and Cinque Terra, five villages along the Mediterranean coast north of Pisa that everyone we know who has visited say we must go - so we are. The five are from all accounts very picturesque seaside villages with spectacular walks along the cliffs between them. Finally we return to the north - beyond Genoa to near Asti for a few nights before flying out of Milano (Sept 26). Hola. We're off to southern Spain (Andalucia) tomorrow (April 10, 2013) for two weeks. After flying from Madrid to Malaga we then drive down the coast to Nerja for a couple of nights on the Mediterrean. We then move on to just outside of Granada, where we will spend a day at the Alhambra. Next it is a bit further inland to the town of Ubeda where we will be staying at another of the historical Spanish paradors. From there we drive west, over to Seville for an afternoon/evening at the Seville Spring Fair. It is then through a number of the Andalucian 'white' towns including Arcos de la Frontera and then back to Granada from where we fly to Madrid for our last day. Follow along and enjoy. We hope the blog of Thailand and Laos was informative, providing you with a flavour of these south-east Asian countries. We certainly enjoyed the trip. If you have any suggestions for improving future blogs (should we continue to publish) please let us know. I plan to try to do the same for our upcoming trip to Thailand and Laos, subject to internet reliability. We leave January 21st, first flying to Newark, then an eight-hour (crossing six time zones) overnight flight to Oslo, where we have a relatively short four-hour layover before an 11-hour flight (again across six time zones an overnight) to Bangkok, scheduled to land at 6:20 am January 23rd. Upon arriving in Bangkok we have two-hours before boarding a short one-hour flight to the island of Koh Samui in the south of Thailand, where we will be spending our first five days. We will be in Thailand from January 23rd through February 10th, after which we spend six days in Laos before returning home.